The arrival of fall usually finds us heading instinctively, like a salmon swimming towards its ancestral headwaters, to Beyoğlu’s Balık Pazarı, the neighborhood’s old fish market. Autumn is quince season in Turkey and that means the appearance – for a limited time only – of one of our favorite desserts, ayva tatlısı (literally “quince dessert” in Turkish, although “quince in syrup” might be more accurate). Nestled in the fish market is Sakarya Tatlıcısı, a pastry and sweets shop with old-world charm that is one of our top stops for this dessert. The apple-like quince is one of those complicated, mysterious fruits that take on a new life when cooked. Raw, quinces are often astringent and inedible. Cooked (granted, with a generous amount of sugar), the fruit assumes a different personality, with a newfound depth of flavor and a seductive perfume. In the case of ayva tatlısı, large quinces are halved, stewed and then baked until they turn meltingly soft and are coated in a thick and sticky reddish glaze (the color is the result of a chemical reaction that is yet another of the fruit’s mysteries). Once cool, the glazed quince is served with a dollop kaymak, the heavenly Turkish version of clotted cream. The addition of the kaymak, whose buttery richness cuts through – yet deliciously complements – the sweetness of the glazed fruit, takes the dessert to almost sinfully good levels. The guilt eating it evokes is only tempered by the realization that you’re actually eating a fruit – albeit one glazed in thick, sugary syrup and topped with extremely rich cream. We like to think of it as a highly refined version of the glazed jelly-filled doughnut. Like doughnuts, ayva tatlısı can become addictive, and we find Sakarya Tatlıcısı, in business for more than 50 years, a perfect spot to get our fix. 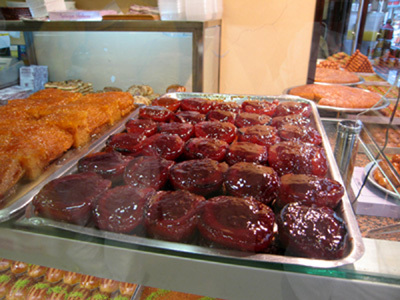 This time of the year, the small shop’s display case always holds a tray of the glistening quinces, next to its usual assortment of (very good) baklava and other traditional pastries and sweets. Many places around town like to spike their quince dessert with food coloring, turning it radioactive red. At Sakarya, the fruit is left to its own devices, achieving an ethereal color that hovers somewhere between rosy pink, ruby red and burnt orange. Although most people breeze into the shop, getting their dessert to go, we prefer to sit down at one of Sakarya’s two tables, order a tea with our quince and take in the atmosphere of the fish market. We would go there more often, but sadly (or, come to think of it, fortunately), quinces – unlike doughnuts – are only available a few months of the year. Here is another article on quince that you might enjoy. It includes a couple of recipes too. hayatımda yediğim engüzel ayva tatlısı ve baklava çeşitleri hele çikolatalı baklava varya aman tadı damağımdan hiç çıkmıyor. afiyet olsun.